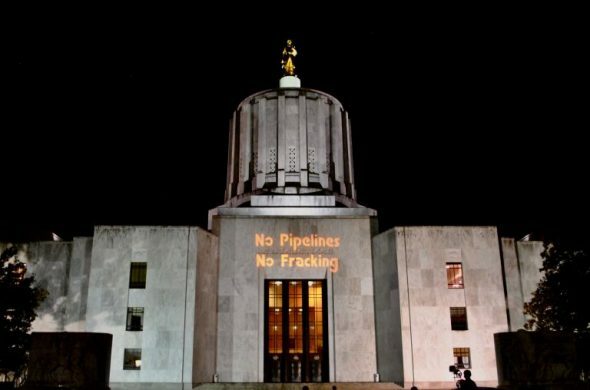 Salem, OR: On Tuesday morning activists with Southern Oregon Rising Tide disrupted the State Lands Board meeting, demanding Governor Brown take action to oppose the Jordan Cove Energy Project. A dozen demonstrators interrupted the meeting with noisemakers before unfurling a banner and reading a statement calling on the Governor and the State Lands Board to deny permits for the fracked gas export project. The protesters questioned Governor Brown’s stated commitment to curbing climate change, citing a recent released last month by Oil Change International which found that the greenhouse gas emissions from the Jordan Cove project would prevent Oregon from meeting its climate goals. After reading their statement, the demonstrators left the meeting without incident. Governor Brown has resisted calls to publicly take a position on the controversial Jordan Cove Energy Project. The project, first proposed in 2004, would build a new liquefaction & export terminal in Coos Bay and a a 230 mile compressed gas pipeline. Where has the Governor Kate Brown been getting her money? Is she being blackmailed? Something is going on here. What is it? Her political career is apparently much more endangered by the moneyed interests behind the fracked gas export project than by the protestors.